The year was 1942. Germany had boldly declared war against the Soviet Union in a mad bid to seize control of Russian territory. Once allies, Hitler and Stalin now found themselves on opposite sides of the battlefield and the fighting was going to be brutal. Germany had made some crucial victories already, seizing territory and moving forces closer and closer towards Moscow. The Red Army was formidable, but the Wehrmacht was making strides in their movements. There was a target seen to be one of the most valuable targets in all of Germany’s war against the Soviet Union. That target was a city by the name of Stalingrad. Stalingrad held a tremendous tactical value to the Russians, for it was a strategic access point to the Volga River. This river had direct access to the Caspian Sea, meaning that controlling the city would allow for them to stop transportation ships from running through. Not only that, but Stalingrad was a major industrial city and was located at a flank that if secured, would be a staging ground for an invasion toward the oil fields of Baku. Hitler was beginning to see that his forces were running out of resources, and without control of that oil, they would not be able to finish the war decisively. With America suddenly entering into the fray and making a point to show they were going to be invading Germany as well as Japan, Hitler had a great incentive to get the war with Russia over as soon as possible. Stalingrad was an important target because of the name that it bore as well. The idea of the city named after their leader, Stalin, falling into the hands of the Nazis would be a humiliation. It would be more than just a strategic victory, it would be a propagandic one as well. The Red Army didn’t have the resources or the time to prepare an adequate defense, but Stalin knew that he couldn’t allow Stalingrad to be controlled by his sworn enemy. He ordered that anyone who was capable of holding a rifle was to take up arms and defend the city with their life. The Germans were coming, but the Reds were going to dig in hard. As the battle began, it was off to a rough start for the Russians. The German bombers were continually dropping bombs on the city and the river, destroying a lot of transports as well as causing significant damage to the city. Stalin had not allowed for the civilian population to leave Stalingrad, choosing instead to keep them behind and utilizing them as workers. These civilian conscripts were either charged with building tanks at the production facilities, given rifles and sent out to fight, or used as anti-air operators. Yet despite the bombing victories of the Germans, they had a greater liability: Hitler. As the war had progressed, Hitler made more and more of a point to take personal command over the militaries movements, often ignoring the advice of his generals and the men whom he had appointed into command. It was his way or the highway. In this case, Hitler made the crucial yet fatal decision to split the German army into two divisions, one focusing on invading Stalingrad and another on moving toward the oil fields of Caucasus. This decision to attack both targets simultaneously was a brand-new plan that he had decided after they had already committed to attacking the oil fields first. This gave the Russians enough time to put together a stronger defense of Stalingrad. So much so was Hitler’s pride, that when his military officers tried to criticize him for this terrible decision, he had them removed from office. When the German army arrived to Stalingrad, they had already done significant amount of damage to the Soviets. The Red Army had attempted to meet the Germans out in the field before they reached the city, only to incur heavy losses of both men and tanks. This slowed the Germans down, but the loss of men and firepower was costly. The city was in ruins and the German 6th Army was confident that they would have victory. Yet the very ruins of the city proved to be the greatest undoing for the German soldiers. The streets were littered with rubble and debris, making navigation much more difficult. Semi-destroyed buildings left areas for Russian troops to take cover in. Tanks didn’t have the mobility necessary to be superior and the German military doctrine wasn’t used to close quarters fighting. What the Germans believed to be easy, turned out to be a nightmare. Stalin had issued an order to the Soviet forces in Stalingrad: fight or die. It was directly ordered that anyone who chose to desert would be executed on the spot. He sent more troops to defend the city, telling them that they were making their last stand there. No matter how horrible it was, no matter how bloody or how many lives were lost, Stalin would not allow the city to fall. Only a man as cruel and evil as Stalin could match the disregard for human life that Hitler had. The intenseness of the fighting did not let up. The Soviets had a system of moving their front line as close as they could to the Germans, essentially turning the combat into hand to hand fighting. The furiousness that the Soviets fought with led to a great deal of German casualties and the battle that the Germans had believed would only last a few days, dragged for months. Hitler, desperate for more manpower, began to tap several of his allies for troops, bringing in soldiers from Italy and Romania to assist in the fighting. Neither of these armies would have the training or expertise necessary to be able to handle what the Russians were planning. As the Germans began to believe they were seeing victory at Stalingrad, seizing hold of many strategic objectives and occupying nearly 90 percent of the city, the Russians were planning a serious counterattack. Winter was beginning to settle in and on November 19th, 1942, the Russians launched a serious attack of the rear flanks that had been settled outside of the city. Hitler had made a serious mistake, as he had not shored up his rear flanks sufficiently enough. This counterattack would quickly lead to the destruction of the Romanian armies. With the German rear flanks disrupted, the tables were suddenly turned. The Russian armies were able to surround the entire city. This changed the nature of the German’s mission, no longer were they trying to seize control of Stalingrad, but rather they were going to have to fight to keep it. The circle the Russians held was weak, however, and needed time to consolidate power and get strong enough for the inevitable German attempt to break through the lines. This is where yet again, the German leadership failed miserably. Hitler had been convinced that the Luftwaffe would be able to supply enough supplies to support the 6th Army, and so he made the declaration that Stalingrad was to be held at all costs. They were to hold it, no matter what. This decision was a terrible one. Instead of breaking through the encirclement when their enemy was weak, the Germans instead were required to dig in and fortify their position. This gave the Russians more than enough time to dig into their own position and shore up the numbers necessary to keep enough pressure on the city for a counter-invasion. To make matters worse for the Germans, they were running out of food and quickly. Earlier, before the battle had begun, Stalin had made a point to move just about all of the food and cattle out of the city. When the troops were facing losing ground, they’d burn up their grain supply, preventing the Germans from getting additional food. Despite the idea that the Luftwaffe would be able to drop food into the city, once the bombers began to run their missions, a great many of them were either gunned down or grounded due to the visual conditions of the Russian winter. Even the German troops, who had been planning on being in the city for a few days, were beginning to succumb to the effects of the harsh winter. They were not used to this kind of fighting. Hitler was deaf to his leaders cry for permission to break out of the city. He did not care for anything except holding the city. The Russians had taken the time necessary to build up a powerful military force and now, seven massive armies were preparing to seize the city back. Yet, they were willing to negotiate. The Russians sent a few envoys to dictate terms of surrender as well as dropped pamphlets into the city promising safety in exchange for surrender. Waving the white flag, they were rebuffed by deaf ears. Despite the desperation in German leadership to surrender, Hitler had made it clear that there would be no surrender. They were to fight to the last bullet and the last man. The Soviets counterattacks were fierce as they were now the ones pushing into the city. The fighting was bloody and brutal, as the Germans had the advantage of defense. Yet, despite all of the deaths and losses incurred on the Soviet side, each battle was growing more and more costly for the defenders. Each bullet fired would not be recovered. There were no more bandages and ammunition was running critically low. The soldiers were starving. It was clear that this was a battle of desperation, yet Hitler still refused to allow his men to surrender. He chose instead to promote the leader of the battle, Paulus, to Field Marshal, a position of honor. However, this was a deceptive action, because if Paulus was captured, he’d be the first Field Marshal to have ever been captured alive. This was supposed to keep him from surrendering out of shame and fear. Despite this action, Paulus knew that the end was near. The lines had collapsed, many of the bases they had controlled were now in the hands of the Soviets. Artillery was firing into their city and ammunition was critically low. There was going to be no victory, yet he had no power to surrender either. Yet, once their bunker was located by the Soviets, Paulus allowed for his aides to surrender. He was taken captive by the Russians, but he refused to utter the words of surrender. This would cause the rest of the German army to fracture into smaller cells, but each cell would eventually surrender as well. The unity of the army was broken and the battle was finally over. What should have been a short invasion of a city turned into five months of sheer hell. This was the biggest defeat the Germans had ever experienced and this more or less crippled them for the rest of the war. The turning point of World War 2 was at Stalingrad, for it was a battle that drained a great deal of German resources and more or less signified the end of Hitler’s ability to conduct warfare effectively in Russia. With the Americans moving in to support the Allies in other parts of the world, the Eastern front would fall into a state of disrepair. The Germans would never again have a single victory against the Russians, as their morale had shattered. 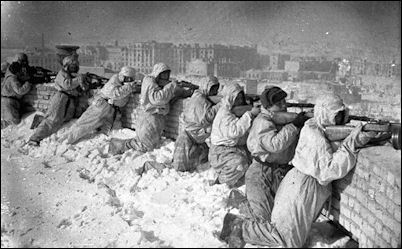 The Soviets rallied around Stalingrad and became to push back in a hard offensive, motivated by the fact that Germany had no chance of victory against them. The battle became a clear indicator that the German army was able to be defeated and that it was inevitable that Hitler would fall. Hitler himself was shaken enough to the point of not being able to give a speech on the anniversary of his taking control of the nation. While the war would rage on and claim a great many lives after this battle, Stalingrad remains to this day to be considered to be one of the most important battles ever fought in World War 2.